We'd like to present you with the August 2016 edition of our newsletter. In this newsletter, you'll find our monthly climate summary, a call for volunteer rainfall observers, information about the record warmth and dry conditions in Florida in July, a summary of a meeting that the state climatologist attended, and more. 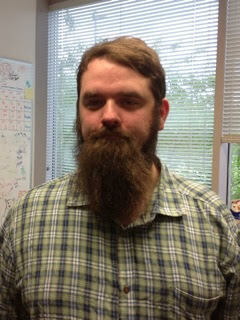 If you have any questions, please send us an e-mail message at climate@coaps.fsu.edu. The Florida Climate Center's July 2016 Florida Climate Summary is now available. The summary provides an analysis of temperature and precipitation patterns during the past month across the state, along with data on hazardous weather, drought, the impacts of the weather, and any records tied or broken for the month. During July, statewide temperatures were record high (more later in newsletter). Although there were pockets of near- or slightly above-normal rainfall, the statewide average total (4.59") was well below normal, ranking third lowest since 1895. Particularly dry conditions persisted in far northern part of the peninsula as well as along the eastern coast, spurring the development of drought conditions (more later in the newsletter). With ENSO-neutral conditions in place currently, sea-surface temperatures continued to be near to somewhat below normal in the equatorial Pacific... The Climate Prediction Center (CPC) predicts above-normal temperatures and equal chances of above-, near-, or below-normal precipitation for the state through October 2016. The following table gives July average temperatures and departures from normal (˚F) for selected cities. The following table gives July precipitation totals and departures from normal (inches) for selected cities. 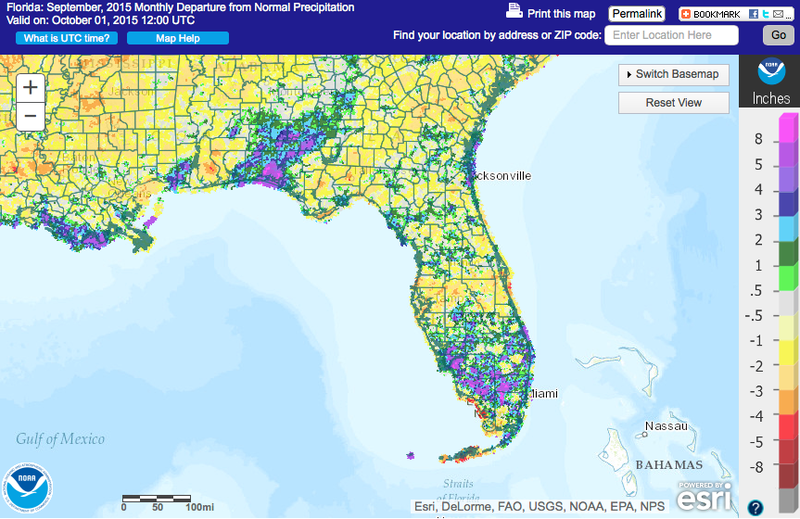 The following schematic maps July precipitation departures from normal across Florida. Image courtesy of the Midwestern Regional Climate Center's cli-MATE application. The Florida Climate Center is supporting a major push to recruit volunteer rainfall observers across Florida. New observers would participate in a program known as the Community Collaborative Rain, Hail, and Snow Network, or CoCoRaHS. CoCoRaHS is a nationwide high-density precipitation-observation network that seeks to supplement existing observation networks owing the great spatial variability in rainfall. 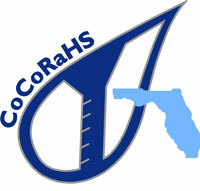 CoCoRaHS data are actively used by many scientific and engineering professionals in their day-to-day work and research. In Florida, some areas, particularly rural, have few observers. These areas include rural counties in the Panhandle and Big Bend (e.g., Holmes, Calhoun, Gulf, Taylor, Lafayette, Dixie, and Hamilton Counties) and inland central and south Florida (e.g., Hardee, DeSoto, Okeechobee, Glades, and Hendry Counties). It is these areas in which we are trying to recruit most heavily. Please contact Danny Brouillette (dbrouillette@coaps.fsu.edu, 850-644-0719) if you or someone you know is interested in joining. Likewise, if you have a way to reach out to more people about the program, please get in touch! These short-term drought conditions have had some impacts on agriculture and society in the affected areas. Farmers reported that much irrigated crops were requiring more water than usual and that the condition and yield of non-irrigated crops were suffering. They also reported that livestock in some of the most drought-stricken areas were being fed hay instead of being allowed to feed on grass. Homeowners were reporting parched lawns, and gardeners were reporting vegetable plots that were not meeting expectations. As reported in last month's newsletter, sea-surface temperatures (SSTs) in the equatorial Pacific Ocean had been cooling in the last few months. Since then, near- to below-normal SSTs have persisted in this region, as shown in the schematic above, continuing to raise the specter of the development of the negative phase of the El Niño-Southern Oscillation (ENSO), known as La Niña. NOAA's Climate Prediction Center recently released an analysis whose conclusion is still that a La Niña episode may possibly take shape by fall and continue through the winter. The CPC this month updated its La Niña Watch, which indicates a 55-60% chance of La Niña formation. According to the CPC, the most likely scenario is a weak episode. For Florida, La Niña generally means drier-than-normal conditions statewide during fall and winter. Across the peninsula, the probability of warmer-than-normal conditions is elevated, as well. For more about ENSO and Florida, click here. The 11th meeting of the Tri-State working group was held on Friday, 5 August, at the Jefferson County Extension Office in Monticello, Florida. The group is supported by Southeast Climate Extension, a regional project sponsored by the U.S. Department of Agriculture's National Institute of Food and Agriculture. Adaptation is always a key topic, and this past meeting demonstrated just how adaptable the group is! Morning rains led to rescheduling field trips to the Fulford and Brock farms from the morning to the afternoon and having the indoor sessions that morning. State Climatologist David Zierden closed the morning sessions with a recap of the past El Ni ño and the weather and climate conditions it brought to the area, a summary of heat and variable rains so far this growing season, and the outlook for a possible transition to La Ni ña and the warm and dry conditions it brings. Unfortunately, the power went out shortly into the presentation, but David continued on in the dark with an attentive audience. The afternoon field trips demonstrated the viability of sod-based rotation systems on the Fulford Farms and high-residue cover crops and conservation tilling on the Brock Farm. David Zierden delivering his talk in the dark. Participants viewing a demonstration of the conservation-tilling techniques. Historical weather observations for weather stations throughout the state of Florida. We are able to provide data for most stations from 1948-present. Long-term historical averages for various stations, climate divisions, and the entire state. Information and analyses on extreme events such as freezes, droughts, floods and hurricanes. With their vast knowledge of El Niño, La Niña and climate variability, the State Climatologist and staff can offer expert insight into Florida's climate trends. Activities, presentations, and workshops that inform and educate the people of Florida about current and emerging climate issues. We also coordinate volunteers for the Community Collaborative Rain, Hail & Snow Network (CoCoRaHS).